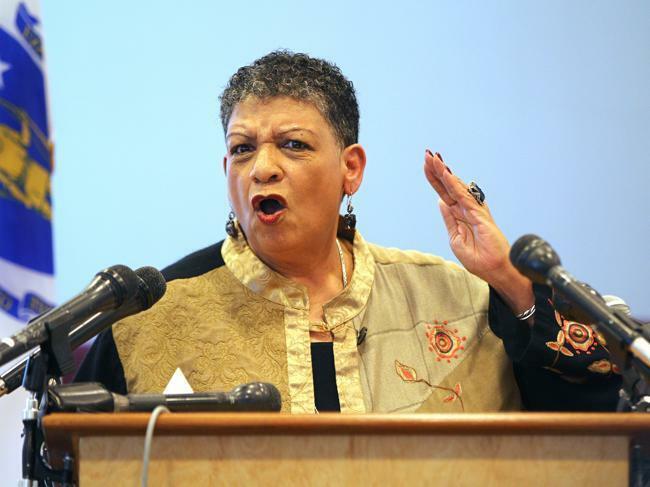 Former MBTA General Manager Beverly Scott was often fiery in her response to questions about T operations and her performance. As February’s snow storms paralyzed the region, the then-general manager of the MBTA complained that leaders of the company running the commuter rail system were “virtually MIA,” and — in a misstep she called “beyond unbelievable” — had sidelined trains because of fuel delivery problems, according to e-mails released to the Globe on Monday. Beverly Scott’s e-mails, obtained through a public records request, offer a window into the T’s chaotic response to the repeated snow storms, and they lay bare the disappointment Scott and other T officials felt with Keolis Commuter Services as it under-performed throughout the winter. The e-mails also show that, during at least one storm, the MBTA’s subway lines suffered as employees failed to report to work to battle the snowiest winter in Boston history. In a candid Feb. 6 e-mail to one of the top officials for Keolis, Scott made clear her disappointment with those running the commuter rail service, which had come under fire for stranding commuters throughout the region. The T contracts out its commuter rail operations to Keolis, a French company. The commuter rail operator said passengers are owed an explanation, but only after regular, reliable service is restored. Keolis took over the commuter rail service in July 2014 with an eight-year, $2.68 billion contract, one of the largest in state history. Commuter rail passengers bore the brunt of the MBTA delays this winter, and late trains still persist today. About 82 percent of trains arrived on time in April, and about 86 percent arrived on time in May. In her Feb. 6 e-mail, Scott said that trains were out of service that morning because of “fuel deliveries,” a misstep that she called “beyond unbelievable.” She then advised Bernard Tabary, the international chief executive officer of Keolis, to make personnel changes immediately. “My recommendation is that you make a move — now,” she wrote. Leslie Aun, a spokeswoman for Keolis, said on Monday that the company was unaware of any problems with trains being out of service because of fuel problems this winter. She also declined to speak further about Scott’s messages. 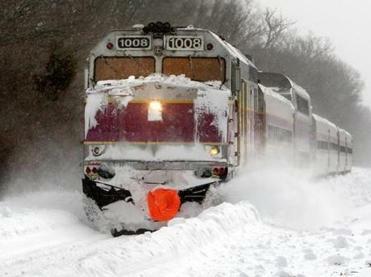 Both the MBTA’s subway system and the commuter rail were battered by relentless and record-breaking snowstorms this winter that began in late January. Yet while the subways were up and running in a matter of weeks, the commuter rail took more than a month to get its schedules back to normal. Governor Charlie Baker publicly made his disappointment clear. But the e-mails also show his transportation secretary, Stephanie Pollack, was exasperated by some of the company’s decisions. On Feb. 9, both the T and the commuter rail shut down service at 7 p.m. as workers struggled to keep the tracks clear of snow. 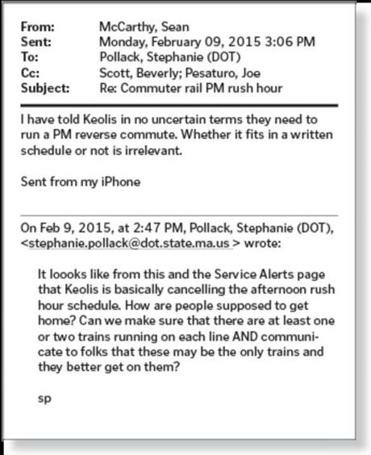 In an e-mail to Scott and other top T officials from that day, Pollack said she noticed that Keolis was also cancelling most of its afternoon trains. Sean McCarthy, a top T official, also appeared to be unhappy by the company’s decision. In a reply to the group, he said he told Keolis “in no uncertain terms” that it needed to run trains to get people back home. “Whether it fits a written schedule or not is irrelevant,” wrote McCarthy, who was then chief operating officer and deputy general manager. That afternoon, the commuter rail cancelled most of its trains going into Boston, but continued running trains out of Boston until 7 p.m. to avoid stranding customers. About two weeks later, Tabary traveled from Paris to Boston to apologize to commuters and to shake up the company’s leadership. Keolis replaced its general manager, Thomas M. Mulligan, with his deputy, Gerald Francis, as head of the service. Scott has since moved on from her post as well. In April, she left the agency and was replaced by Frank DePaola, the chief operating officer and highway administrator of Department of Transportation. Scott staunchly defended the MBTA and her workers throughout the winter. In a fiery press conference before her resignation, she repeatedly said a glaring lack of resources led to the T’s performance. But the e-mails revealed old infrastructure and extreme weather weren’t the only problems facing the T. On Feb. 16, in the middle of another debilitating storm, McCarthy told Baker’s chief of staff, Steven Kadish, in an e-mail that absent workers made it harder for the subway system to recover. “Heavy winds caused massive drifting overnight causing more functional losses in equipment, track infrastructure including switches and manpower issues due to employees not reporting,” McCarthy said in an e-mail to Kadish and other T and administration officials. And while some of the e-mails revealed Scott’s frustration with commuter rail service, they also shed some light on questionable decision-making regarding subway service. On Saturday, Feb. 7, McCarthy e-mailed several high-level officials. A weather forecast showed an additional 24 additional inches of snow could hit the area through the weekend and the beginning of the week, he wrote. “If this forecast is legitimate, we need to start considering suspending rail service at some point Monday” on the tracks that aren’t within underground tunnels, he wrote to Scott, Pollack, MBTA spokesman Joe Pesaturo, and DePaola. McCarthy, who recently retired from the T, was blunt about what could happen if the T tried to run its trains through that much snow. He predicted that the T might need to evacuate passengers out on the tracks. The T then ran reduced service that Monday morning and afternoon — and McCarthy’s predictions largely came true. Early Monday morning, a Red Line train was stranded for about two hours in Quincy after a power failure. Nearly 50 passengers had to be evacuated from the train and transferred to shuttle buses. Later that day, the T shut down all its rail services at 7 p.m., with no service through the following day. Still, Pesaturo, the T spokesman, on Monday defended the agency’s choice to run its trains through the storm.